Meet Jeff. Jeff is an adult graduate of our Child Sponsorship Program and Leadership Development Program. He has a bachelor’s degree in Social Work, a master’s in Public Administration, and plans to pursue his doctoral degree. A registered social worker, he is an on-call child advocate, lecturer and counselor. He volunteers at a Compassion child development center and is the Program Adviser at the College of Social Work and Psychology at Pangasinan State University. Jeff also just served a sponsor by processing a gift for her child over the phone. When you dial our customer service phone number, you have a good chance of being connected with a member of Team Constellation, which is based in the Philippines. Each of the members of Team Constellation are adult graduates of our sponsorship program. They know firsthand what sponsorship means to a child in poverty. The team chose the name “Constellation” because Compassion is like a constellation to each of them — a group of stars shining brightly in the sky at night. Compassion was a light to them during their darkest times, and now they seek to be a light to others. Let us introduce you to some more of the men and women who make up Team Constellation. Cres is the “big brother” on Team Constellation. When you first meet Cres, you are instantly aware that he is a natural leader. Cres is working on his undergraduate degree and served as the youth coordinator at a Compassion center for four years prior to being hired on to Team Constellation. His wife, Sheryll, is also a graduate of our sponsorship program, and she works as a case worker at the child development center that they both grew up in. Being part of the teaching staff is my most fulfilling and fondest memory about Compassion — to be able to share my faith and experiences with the other children. It was never the privileges that ultimately made me love Compassion. It was the opportunity to be blessed and be a blessing to others. 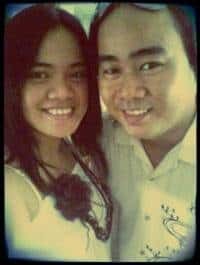 To Jessa, serving God is her rest, and she so loves to spend quality time in God’s presence. Jessa has been praying for years for the salvation of her family. Her father and her older brother are Muslims. Because she is the youngest and one of the only Christians, she often feels like she is the only one in her family standing up for her faith. But she loves her family so much and prays for them often. Jessa has a bachelor of science degree in Entrepreneurial Management. In July, she started sponsoring a child from Nicaragua. She travels three hours each way to work every day. [I am] so grateful to be part of this ministry as I was once a recipient of Compassion. It’s such a great privilege to bring back to Compassion what you planted in me. 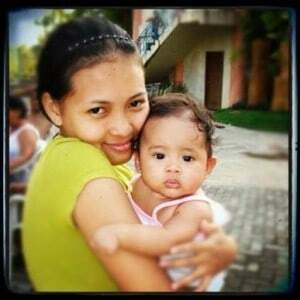 Joann is a loving single mother to a 3-year-old daughter and is trying to be the best mom she can be. She has a bachelor of science degree in Medical Technology. Even though her commute to work is one hour each way, jumping on and off of several buses, she shows up early to pray before work. Joann was overjoyed when her former sponsor called Compassion and she was able to serve her sponsor on the phone! Are you impressed by Team Constellation yet? Team Constellation members do what they do as a ministry to God and out of thanks for what God has done in their lives through Compassion. Many of them have a photo of their former sponsors on their desktop at work to remind them of what their sponsors did for them as they serve other sponsors. Almost all of them travel hours to work each day but they come to work early to pray and prepare for their shift. They do what they do as an act of worship, praying and singing songs between calls. If you have a chance to speak with a member of Team Constellation, and you have a little time, give them a chance to tell you their stories. Their stories will blow you away! We will be posting more about the “hows” and “whys” of Team Constellation. Stay tuned to learn even more about this group of amazing men and women who love and care about you! Pls, if we will find favour in your hearts, pls contact us to my email. What a blessing to speak with the Philippines call center. Praise God! 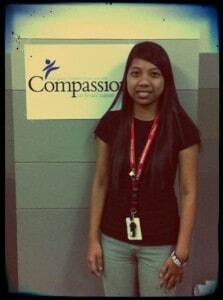 I called Compassion today to find out more information about sponsoring a child, and I connected to Team Constellation in the Philippines. A girl named Angi (forgive me if I misspelled your name) was a big help. I had a million and one questions which she answered skillfully and with a lot of patience. She shared her story of all that Compassion has done for her, and she definitely encouraged me about Compassion and the difference it makes in a child’s life. 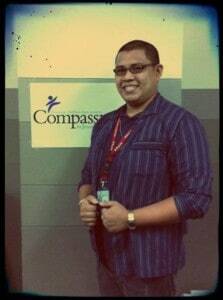 May God bless Compassion and Team Constellation! I just spoke with Jeff from Team Constellation when I called Customer Service. What a pleasant man! When I asked him if I was talking to a rep from Team Constellation, he told me his testimony about being a sponsored child and said that he has been released from poverty. Praise God! What a thoughtful way for these 23 individuals to give back to Compassion. Thank you for your hard work! I called a few weeks ago and talked to some one with a Filipino accent… I wonder if it was someone from this office. That person sounded very nice and was helpful. I was having a pretty tough day today and have been in a tight financial situation lately. I received an email from Compassion that I have missed my payments for the past several months and somehow was not aware because of some mailing issues. I was so upset that we were so behind and I wouldn’t be able to afford it right now, but the Team Constellation member on the other end was AMAZING! He helped me out and was so very very kind (even when I probably wasn’t.) So, I would love to say I’m sorry and I really appreciate him! God Bless what you all are doing. Thank you for letting me keep my sponsorship. I love ya’ll! Team Constellation has been a great blessing to me! I love their sweet, kind, helpful cheerfulness when I call with a question or a request. Thank you so much for telling us more about them. I hope you will let them know that every time I talk with them, they brighten my day!